In addition to custom slipper socks, we also offer a variety of stock products! The stock Breast Cancer Awareness Ribbon sock is a white, plush breathable terrycloth in an XL Adult ankle length slipper sock. Printed with pink ribbons as the slip-resistant tread, this sock is great for fundraising events, non-profit organizations, Walk for the Cure events and gift bag items! Made of soft, snuggly terrycloth fleece, these baby booties keep newborns’ feet and ankles warm. Spread holiday cheer with PromoTreds Holiday Socks! 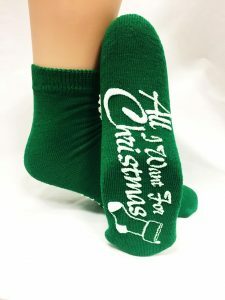 These socks are semi-customizable, meaning you get to choose a stock imprint, sock and ink color! No screen charges make these socks affordable and fun! Soft and comfortable, these examination table OB-GYN stirrup covers provide a slip-resistant surface to personalize a clinic or OB-GYN practice.